How: A copy of this novel was provided by the author in exchange for an honest review. Honour and Horatia Frie are twins living in Forgotten London – all that is left of London following the solar flares that hit the earth twenty five years before. Life is hard, and the world is a dangerous place. States practically rules the world, and people are dying of The Sixteen Strains – and not living beyond age twenty. Enter Branwell and Bennet Ravel. Living in 1878, many years before the solar flares of the future, these twins are devastated by the mysterious and suspicious death of their inventor father. When his invention, The Lux, goes missing, and plans are uncovered that could mean certain death for almost everyone on earth, the twins are determined to find their father’s invention – and stop the plans of those who have it. How these two sets of twins are connected … you will have to read to find out! 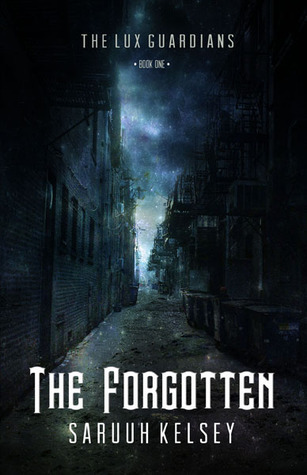 The Forgotten is the first in a series; The Lux Guardians; and boy am I glad this is a series! I loved the mix of magic, history, and dystopia – my three favourite things to read in a novel. I am also a fan of the layout of this book. First person (my favourite), and for practically all the characters in the book, to boot! I loved the description of the characters; they all felt very real, and each character chapter was easily distinguished by their distinct thoughts, and feelings. I have three favourite characters, which is rare for me. I have a hard time picking between Honour, Yosiah, and Branwell – they are all protective, loving, and adorable boys. Sometimes the description of places and people was lacking a little (the only reason why it is 3.9999 stars, and not four). I had some confusing moments regarding character’s physical demeanours, and sometimes even sexes. But other than that, I enjoyed every minute of this book. The first sentence drew me in, and from there on in, I was in the world of The Forgotten. It was a teensy bit slow around the 100 page mark, but then it picks up again, and you are on the edge of your seat, wanting to know what is true, and what are lies, and what is going to happen. Overall, I enjoyed Honour’s chapters the most. I loved his thoughts, and the way he thinks, and feels about things. Especially the last few chapters – they were my favourite of his. The way he loves his sister is very fierce, and admirable. I seriously cannot wait for the second instalment of The Lux Guardians, and will be keeping my eye out for it. © 2013, Chiara @ Books for a Delicate Eternity. All rights reserved. I really did like it – I hope you do, too! I’m so glad you linked back to this post from your guest post by Saruuh Kelsey. It must feel like so much time has passed between then and now. I haven’t heard of this series before. Your review has really hooked me! Character development is key to my loving of a book. It sounds like this has PLENTY to chew on.